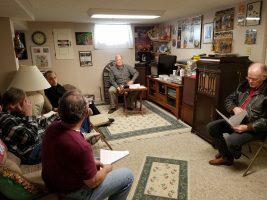 Attending: Jerry Rappel, Dave Perkins, David Fitkin, Bruce Sorensen, Doug Spyrison, Bob Ward, Bob Thornton, Alexander Martin. Minutes of the last meeting had been published on the club website, no corrections were offered. Treasurer was unable to attend. 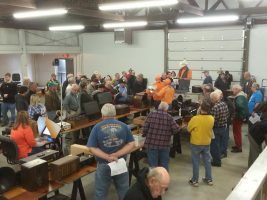 Auction Update: President Dave reported on the upcoming April 28th Radio Auction (details available elsewhere on the website). Direct mail advertising of over 200 postcards has gone out. Social media including our website, mailchimp notices to our members, multiple Facebook groups, and Craigslist is arranged. The auctioneer usually places the Cedar Rapids Gazette notices. Members are advised to obtain a lot number and send their photos to the auction coordinator early. Club volunteer manpower is needed, please contact Dave Perkins or Craig Huseboe. 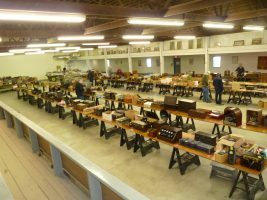 News for next years auction: Craig Huseboe has asked to resign as auction coordinator (our thanks to Craig for many years of service) and this role needs to be filled. We will return to the 1st Saturday in May as auction day in 2019. It was agreed club meeting details will go out by mailchimp email to the active membership list or by contacting the President. The date, time and city of the meeting will be posted publicly. Due to the perceived difficulty of updating your own membership email address, you may submit those requests to the club president, secretary or webmaster. We are working on better maintaining the Google calendar on the website. 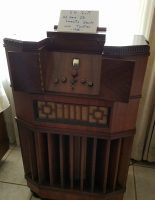 Members are reminded to send their photos of Iowa manufactured radios to David Fitkin to be used on our Iowa radio manufacturers web page. We need more volunteers for our radio repair contact list as it is a frequent request made to the club to get a radio repaired. 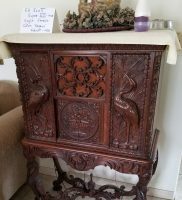 For sale/ classified ads can be placed on the website or our Facebook group. Next meeting: June 30, 2018 Clear Lake, IA Watch your mailchimp reminders for details. Meeting adjourned and we enjoyed the usual pizza for lunch. 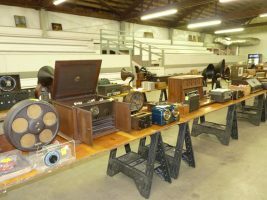 We toured Jerry’s vintage radio collection / ham radio room, which had many restored and operating vintage radios, mid 1930’s – 1950 era. 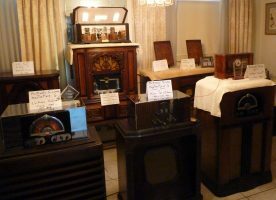 Amongst his collection was a 1940 RCA VICTOR RADIOS red neon sign, 1948 restored Sentinel 7″ (7JP4 – CRT) TV, model TV400, 3 – Wards, Airline restored film dial radio, a rare operating 1948 Robert Lawrence coin radio, a rare Stewart Warner “Smokerette” radio, and a Stewart Warner “Porto Baradio” – both circa 1948. 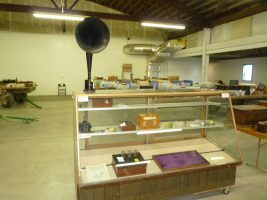 Jerry demonstrated his 1919 Edison model C-19 phonograph, with the Edison record – “The Iowa Corn Song” from 1920. 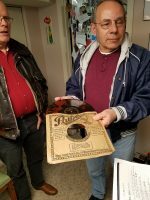 Jerry showed us several early Edison Diamond Disc records and explained the differences in the early record formats. 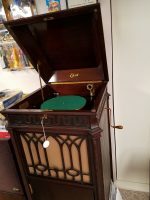 He also has a large collection of unique 78 records, mainly pre 1925 era, including one of the first Berliner 7″ records from “1899″. 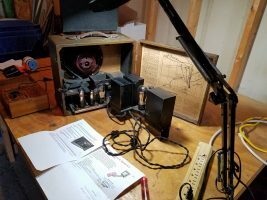 On the project bench was a 1927 Trav-ler model – T-34746, AC/DC portable radio. Jerry worked about 30+ years in broadcast radio and TV, having spent 22 years at WQAD-TV in Moline. 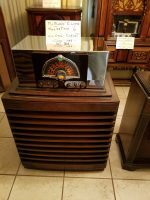 After the meeting, we drove to Moline to tour Bruce Sorensen’s terrific golden era console radio collection which appears in another post. 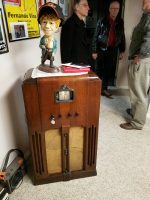 Club members and guests at the 3/31/18 IARCHS meeting in Davenport were invited to visit Bruce Sorensen at his home to see his collection of classic console radios. 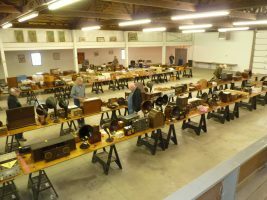 Bruce has assembled what may be the finest collection of the 1930s “Golden Era” EH Scott and McMurdo Silver radios. I will let the photos, placards and captions do most of the talking. 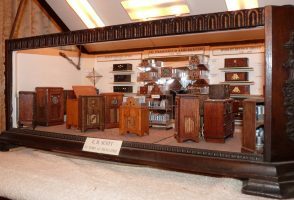 While Bruce’s main interest is Scott and McMurdo, there are a smattering of other top of the line radios and custom cabinets. Zenith is conspicuous by its absence. Most of the radios have been restored and many were playing at the visit utilizing his SST AM transmitter. Chassis restoration has been done by experienced restorers. 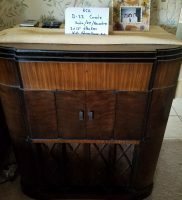 According to Bruce, finding original cabinets is the hardest part. 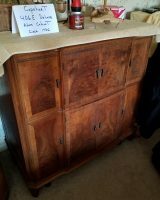 Bruce sends the cabinets out of state to experts experienced in bringing the cabinets back to factory finish condition. 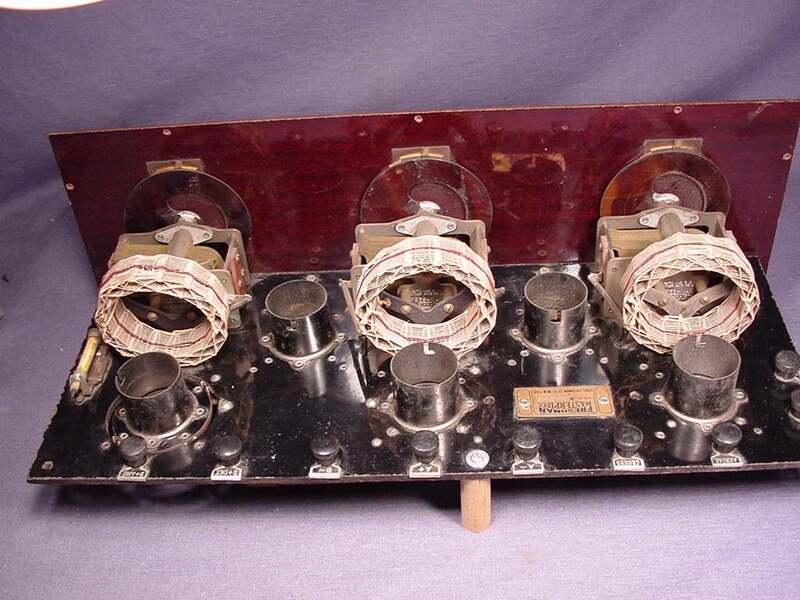 Step down transformers are used to keep the radios protected from modern AC voltages which often runs over 120V. Voltage is reduced to 105V which helps protect radios designed to run at the old AC 110V level. The search for these uncommon high end radios has run far and wide. According to Bruce, trading in this segment is subject to some frustration as it not unusual to lose contact with buyers, sellers, and repair people for long periods. 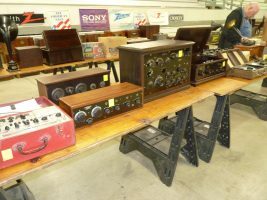 It was a pleasure to see and hear these wonderful radios. 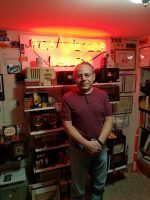 Bruce Sorensen: “I started collecting radios in 2004 when I retired and I seldom watch TV but always have been a radio listener as far back as I can remember. 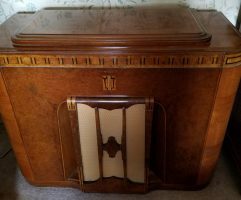 Since then I have gravitated more to the high end 10+ tube 1930’s consoles. 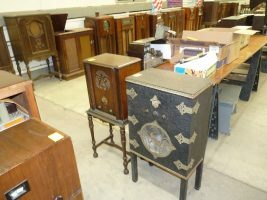 I am a collector not a restorer, so I focused on EH Scott consoles and at one time had 35 in my collection. Lately I have focused more on the ultra rare McMurdo Silver Masterpiece series and currently have the entire run of all 7 versions offered. I am downsizing some of my collection so others can also enjoy listening to these old classics. better from the back than the front? 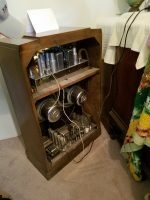 Custom cabinet, chassis not yet identified. 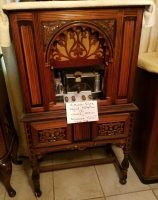 Magnavox entertainment center elegantly housed in fine period cabinet. Don’t FORGET, AUCTION April 29!!! 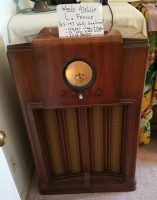 A Reminder, sort out those radios that need a new home. 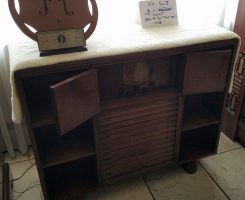 Free up that display cabinet for some new acquisitions. 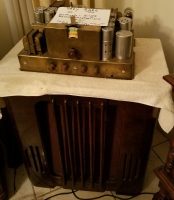 Send those pictures in for advance advertising to get the best price for your best radios (advanced advertising ends on April 24th). As of today, the auction is 5 days away. If you are traveling from a distance, get those hotel reservations now. Hope to see you and your radios there. 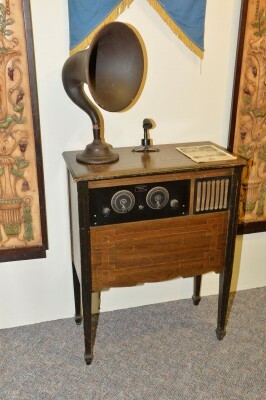 Shenandoah Super Six Radio Console, located at the Shenandoah IA historical museum, home of Radio Station KMA. We would like to illuminate our encyclopedia of Iowa radio manufacturers with pictures for all the different radio brands. 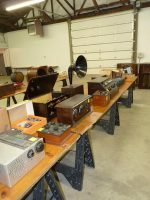 If you have one of these radios and would like to help, please send us a nice picture to add to this website. Make sure you include the Model name and year of manufacture so we can include it in the description. We will identify you as the picture source on the site as well unless you specify otherwise. If you know of any other Iowa manufacturers that we don’t already have shown please let us know so we can add them. You can send them to our webmaster, David, using the Club email Radio-Pictures@radio-collector.com. 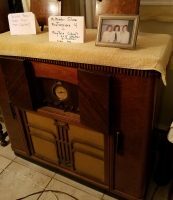 If you like old radios, and specially if you are an Iowan, or live in one of our border states (Nebraska, Illinois, Minnesota, Missouri, South Dakota, or Wisconsin), we would like you to consider joining our Radio Club. 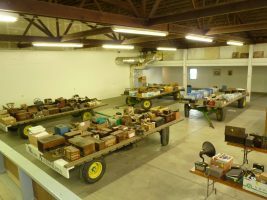 We support Iowa manufactured radios with website information, and best of all try to connect collectors from everywhere. Membership is free, and the member experience is priceless. Consider joining today. Our 2016 Summer newsletter is now online, available for all members to read and download.Time to register your membership online. 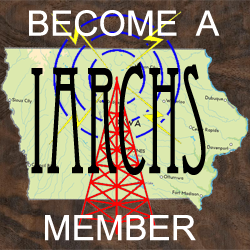 IARCHS membership is free, check out our membership page for more information.